Ask fellow campers about "Pipestem Resort State Park" and nearby attractions. This campground is part of a much larger state park. The campground is kind of basic but still a good choice. 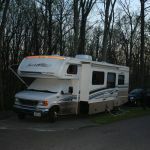 The sites are small for large RV's and we had to work to get into our site because of the camper in front of our site. The electric hookup is on the wrong side of the RV so you have to run the wire under the camper and walk over it to get into the RV. Our site was right along the road length wise so we had a lot of campground traffic going by. All in all still a nice campground. No wifi or cable but we did get the local OTA channels. We would stay again but look for another site. We camped at Pipestem Resort State Park in a Fifth Wheel. The golf course is great but kind of expensive, 49.00 at the senior rate with a cart. We've been to Pipestem several times in the last three years, and it is still one of our top places to visit. We have two older teens and a seven year old and this is at the top of their list as well. There are volley ball courts, pools (for a fee). basketball courts, tennis, par3 golf, miniature golf, a stunning pro golf course, horseback riding, trails, soccer golf, frisbee golf, and tracks for remote control cars. The resort is simply picturesque and it is worth a trip to the hotel to see the view over the gaully from the lobby. Also, take the tram to lodge down by the Bluestone river. There is a five star restaurant down there as well. The Nature Center is very interesting, offers programs, and well staffed. There is a small library there that we utilize every year. They couldn't be more helpful and some of the kids' books are one of a kind and we love them. The campground itself is spacious and well laid out. The only caution is for trailers or RV's over 40+. I saw plenty of them, but be aware that the pads on the sites are small. The sites themselves are wide, but maneuvering onto the pad for something large will require a little effort. We will be back next year! We camped at Pipestem Resort State Park in a Travel Trailer. We love driving a few minutes up the road into Athens and eating at Genos Pizza. Truly, this may be the best pizza on the planet! So incredibly affordable and wonderful service! This is an amazing state park! It is immaculate, spacious, green, and beautiful with tons of amenities (indoor and outdoor pools, horseback riding, tennis, disc golf, etc.). It's a resort (in the sense of state parks) but it is also a state park (in the sense of resorts). The only thing lacking was wi-fi, but we had full LTE cell service (AT&T). We did not try satellite or OTA TV. We stayed one night in site #20, a pull-thru with W/E/S. It was a little unlevel, but not bad. We wished we could have stayed longer and look forward to returning someday. We camped at Pipestem Resort State Park in a Travel Trailer. I think most everyone who reviews this RESORT must not stay at real RV resort parks, are so overwhelmed by how far out of the way Pipestem is, or maybe it's the winding Rt. 20 through WVa's southern backcountry. Yes, its beautiful, green, & hilly. Yes the tram down to the Bluestone is spectacular. But those poorly kept, skinny horses crowded into the corral must spend their lives in misery; my wife & I felt for them. With much of the park's attention spent on the Resort hotel, cabins, & golf course, this is NOT a true RV Park resort. This was my 3rd visit to Pipestem. The first to the Resort hotel a few years after it opened, next to the campground some years later, and now many years later this poorly designed campground that comes across more as an after thought. The tent sites are situated in an open near-level "field" with little shade. The full hookup sites shoehorned along a sloped area which results in some serious leveling challenges (Site 11 pull-thru was 4 inches in 8 ft.; bring extra leveling blocks!!!). There was no place for our dining canopy. A couple sites had decent room for a canopy or spare ten but most were narrow loops right off the road. Kids on bikes right outside your window. This is not my idea of a getaway to the great outdoors let alone an RV Resort. Oh, come prepared to play in the poison ivy along most of the poorly maintained trails. We camped at Pipestem Resort State Park in a Travel Trailer. We stayed at site #1 on the full hookups loop. Site was a curved pull through and it was the wrong way...we had to turn around in the road and come in from the other direction to be in the right orientation. Site was level but I noticed that many sites throughout the campground were not...so reserve with caution. No satellite on our site, good Verizon. Showers were not the cleanest but were not unacceptable. We camped at Pipestem Resort State Park in a Motorhome. Lots of hiking and mountain bike trails. There is also a tram that you can take as long as it is not too windy. We have stayed at this park before with family members but this time just an overnight stay. I very much regretted being on the road and not being able to spend more time here. Great hiking trails, lodge facilities, quiet peaceful park. This is truly a resort with lots to do. It is a great place for family reunions as they have the lodge and campground. We were here as spring was coming into the old mountains. I would highly recommend visiting here in late April early May. With so many parks claiming to be resorts it is a pleasure to stay at a "real" resort at state park prices. 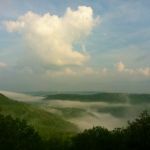 Let's give a cheer to West Virginia as we have always found the state parks second to none. We camped at Pipestem Resort State Park in a Motorhome. What a beautiful park! It covers 4,050 acres through the beautiful Bluestone River Gorge. The park got its name from a common, local, shrub: pipestem also known as narrowleaf meadowsweet, historically used for making pipe stems. There are 2 lodges in the park, one has a large conference center, and the other is only accessible by an aerial tramway to the bottom of the gorge. In addition to an RV park, there are 26 fully equipped wood cabins, and an area set aside strictly for tent camping. There's not only a par-3 golf course, there's also a championship golf course on the property. Several restaurants are onsite at both lodges; horse stables, a nature center, hiking paths, cross country ski trails, and other recreational activities are available. The nature center, featuring displays of native plants and animals, also includes the Harris Homestead, a reconstructed 1900s period historic house museum and meat house. An amphitheater is also available for concerts, storytelling, and local theater productions. As you can see, there's never a shortage of things to do here! A weekly schedule of events is posted so anyone in the park has an opportunity to take part in any of them. Many sites are shaded (some more than others). Our site (#29) was open but close to trees and adequate for our 32' fifth-wheel trailer. It was an angled back-in site with ample room for the back in maneuver. The campground restroom facilities were adequate and clean (we did not use showers). During our short 3-nught stay here we took advantage of some hiking trails, a motorcycle ride through some beautiful country and the "Wings of Wonder" presentation at the McKeever Lodge and Conference Center. Although our stay was short we made the most of what this clean, well-managed, park has to offer. We camped at Pipestem Resort State Park in a Fifth Wheel. Explore, explore, explore! This is a beautiful part of West Virginia. Don't miss "Wings of Wonder" if offered. It is a wonderful presentation of birds of prey. For a state park, this was probably one of the most beautiful parks we have stayed in. The camping area is really laid out to accommodate trailers & 5th wheels, & I think our 42 ft. class A was a little bit of an over-kill. Maneuvering the lanes to our spot was pretty tight, but manageable. Be aware that their pull-thrus are semi-circular, with water faucet & sewer tap on the driver's side & electric box on the passenger side (so had to reel out quite abit of electric line and pass under coach to the plug). Other than that, utilities were good. The property was developed and opened around 1972 and is a little dated, but clean. The park must have been absolutely incredible for the time period. How the state legislation appropriated that much money for a state park of this magnitude is impressive. Lots to do: horse back riding, golf, disc golf, hiking trails, tennis, swimming pool. The pity of all of this is that other than Pipestem, West Virginia does not have many other campgrounds that can comfortably accommodate large class A coaches, with full hook-ups & 50 amp service. West Virginia is a beautiful state, but missing out. We camped at Pipestem Resort State Park in a Motorhome. Ate breakfast at the lodge & also ate dinner at the restaurant at the base of the mountain via the cable car which is a really cool experience. Food at the base restaurant was first class and delicious! Such a lovely park and so much to do. A family could enjoy an entire vacation here. Surrounded by mountains and tall trees. There is a Tram to take you down to the river. 3 Lodges and each has a dining room. There is golf, summing pool, lake for canoes/fishing. Our space was tight but we enjoyed it. Next time we will stay in a pull through rather than the back-in. We camped at Pipestem Resort State Park in a Motorhome. Just be sure and ask for a pull thru if you are in a larger RV. Also be sure and visit the lodge to find out what is going on. There is an ampitheater with live entertainment and we didn't know it. Also horseback riding and hay rides. Really wonderful park. This is a really beautiful place. We stayed on site 15 which was very nice, but beware, we had to buy an additional 20 ft long sewer hose to reach the sewer hookup as it was at the front of the site by the road. As the site slanted a bit downhill from the hookup, I am sure you can imagine the rest. It was tough. I didn't see this issue on any of the other sites. The back-in sites are very well shaded. Great big loops for walking in the evenings. Each site has a trashcan mounted on a pole with a bag which is changed out each morning by the campground staff. The downside of Pipestem Resort is that as a camper, you pay for everything. Pool is $3, mini golf is $4 each, disc golf is $3 each. The remote control tracks (one paved, one dirt with jumps!) is free. Overall we had a great time. The pool is pretty cold, so get ready :) The sewer issue is why I am giving it a 9. Otherwise, a 10. We camped at Pipestem Resort State Park in a Travel Trailer. It's about 25 min drive to Kroger/Walmart, so be sure to stock up on your way in! Check out Sandstone Falls, The Market Restaurant (Hinton), Lynn's drive-in restaurant (Bluefield). The disc golf course is awesome. Also really enjoyed mini-golf. It's cool at night, even in the summer, so pack a jacket. The tram is AWESOME but costs $6 per person. Kids are $4. We bought day fishing licenses so we could fish the area. This is a very nice park with tons of family activities to do; the most I've seen offered at a state park. Sites are tacky though due to the mountain location - leveling takes some work. The park is clean and well kept. It would be "10" if the sites were better suited for modern equipment. We would return, but would hope for a back-in on the last lane from the ranger station. We stayed on an advertised 50' pull through, but you would have a difficult time with anything over 43' (IMHO). The site was a curved pull through that had the electric hook up on the passenger's side which sometimes happens with older state parks. Since the site reservations are not site specific, I would recommend arriving before the weekend. We camped at Pipestem Resort State Park in a Travel Trailer. Check out the river bed at the bottom of the sky lift. ...Simply beautiful valley and river. Beautiful campground. Spacious asphalt sites. Great walking trails and a wonderful place for the kids ride their bikes. We camped at Pipestem Resort State Park in a Travel Trailer. Pipestem is one of the Great State parks in the country. The staff was very friendly and helpful in letting us drive around and choose the site we wanted. We did notice that many of the sites are not real level so if that matters, you need to be more selective. We were able to get local channels on our antenna and using a dish is a little trickier because of the trees. The best sites are the curved pull-throughs on the last road to the south. Going to Hinton right now was a problem due to extensive roadwork and blasting going on at Bluefield down the hill. They had a special going on during the month we were there, half-price on the sites. We appreciated them telling us about it because it saved a lot of money, and they didn't have to. We camped at Pipestem Resort State Park in a Motorhome. This a great place to stay with a family. The State Park has many things to offer for all ages. 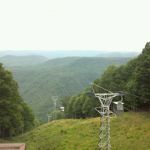 There are hiking trails, bike trails, an observation tower, horseback riding, fishing, lake activities and all sorts of games to play for a small fee. They also have an 18 hole golf course along with a par 3 nine hole course. My son and I played the par 3 course and enjoyed it. Our family did the 1 hour horseback ride and while we enjoyed the ride, it was a little bit more geared for the beginner rider. The outdoor pool was closed for the season, but the indoor lodge pool was available for a fee to RV campers. While there is no Internet at the RV campsites, you can use the Internet at the lodge for free. The lodge has a game room with various activities for a small fee. The wildlife was abundant during our stay. The deer are everywhere and very used to people and will allow you to get close to them. During our stay we saw a bear cub (did not see mama, but also did not wait to see her), turkeys, a muskrat and the other animals you would expect to find. The views are breath taking throughout the entire park and the Fall leaf colors certainly added to it. We stayed here in a 42 ft fifth wheel for 10 days. We had previously stayed in West Virginia State Parks over the years in cabins, but this was our first RV experience. We are planning to return next May. The on site staff was extremely helpful and nice. The only negative was that many of the RV sites were not quite big enough for us and many of them were not level. We did find a level one and are taking note of other level ones for our return trip. The atmosphere of the RV campsite was good as the sites while close to one another, were not on top of one another. 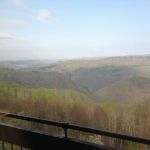 We camped at Pipestem Resort State Park in a Fifth Wheel. Very lovely treed campground with about as many amenities available in the park as anyone could wish for. Sites are mostly level. AT&T cell phone reception was good. Trails were wet and uneven. Rate reflects senior discount. We camped at Pipestem Resort State Park in a Motorhome. It's about 25 min drive to Kroger/Walmart, so be sure to stock up on your way in! Check out Sandstone Falls, The Market Restaurant (Hinton), Lynn's drive-in restaurant (Bluefield). The disc golf course is awesome. Also really enjoyed mini-golf. It's cool at night, even in the summer, so pack a jacket. The tram is AWESOME but costs $6 per person. Kids are $4. We bought day fishing licenses so we could fish the area. Are you affiliated with Pipestem Resort State Park ?